We turned right out of Aughton Park Station and headed up Long Lane. 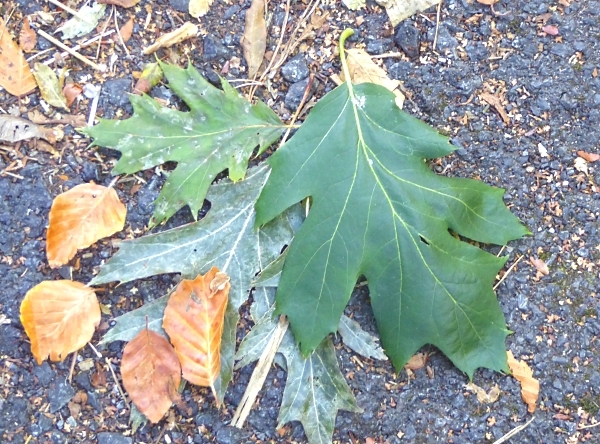 At the corner of one of the gardens there’s a Red Oak Quercus rubra, with its enormous leaves. Here are a few with some Beech leaves for scale. We turned left at the junction of Holborn Hill, crossed at the pedestrian lights and then headed up the footpath to the Communications Station. A Kestrel hovered above the field on the left. This year John led us the long way around, going right from the gates, then left on a shaded footpath around a cultivated field. Several Robins tutted gently at us as we passed. We had an early lunch by the pond, and saw a “V” of Pink-footed Geese passing overhead, about 20 or 30 of them. 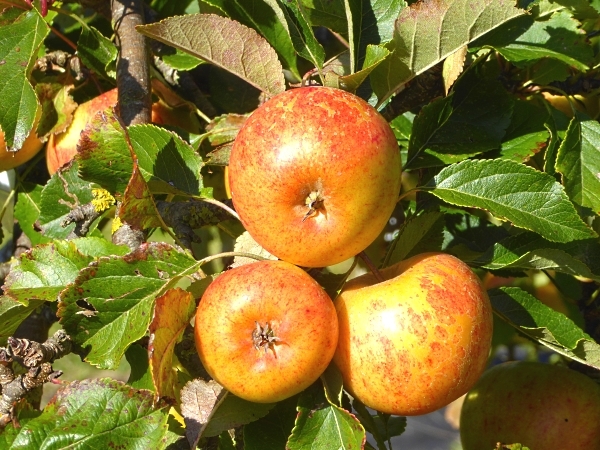 The second weekend in October is when Gorse Hill NR have their Apple festival, and they sell their harvest of traditional varieties of apple, their freshly-pressed apple juice and some pretty lethal cider. They also demonstrate their apple press and give tours of the orchard. They have about 100 trees: half are cooking apples, in 12 varieties, and the other half are dessert or eating apples, of 16 varieties. They also have four kinds of pears and a plum tree. 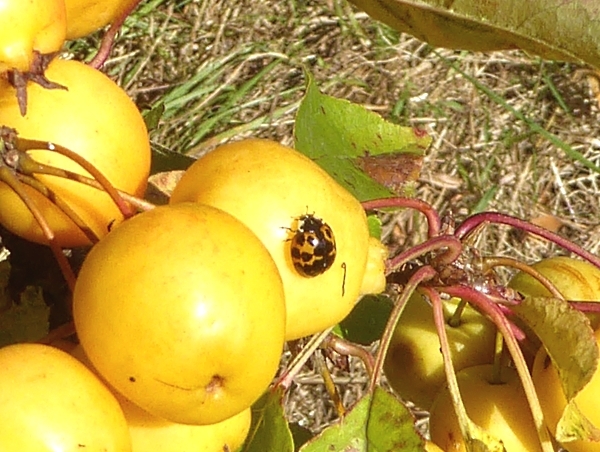 All around the orchard are crab apples for pollination, variety Golden Hornet, which are now bunches of little golden globes, each about an inch across. There was a ladybird on one of them, which I hoped would be something exciting, but it was just another colour variation of the Harlequin. After the tour we shopped for apples and cider. 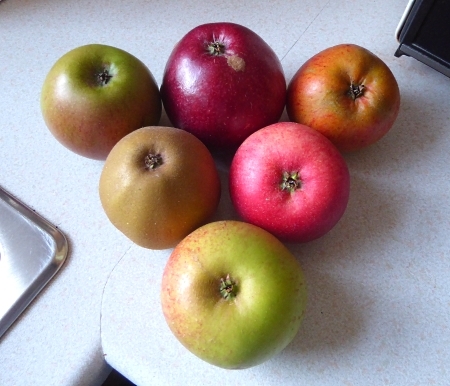 I now have one each of Ribston Pippin, Worcester Permain, Sunset, Wheeler’s Russet, Ellison’s Orange and King of Pippins. We patronised their café before we left, and I strongly recommend their lemon and lime drizzle cake! In the hedgerows the Hazel catkins are showing, although the leaves haven’t fallen yet. 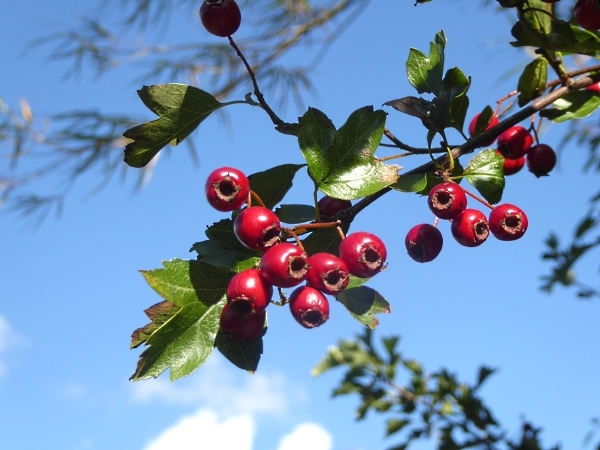 I also took note of these Hawthorn berries, which were a rather dark red. Nobody takes any notice of Hawthorns, but there are many species. The Common Hawthorn Crataegus monogyna has deeply indented leaves and only one seed in the Haw. The other commonish one is the Midland Hawthorn Crataegus laevigata, with less-indented leaves and two or three stones in the fruit. Confusingly, there are many hybrid forms. This one appeared to have a trifoliate leaf, and I regret I didn’t investigate the number of pips. I will start opening them next week! 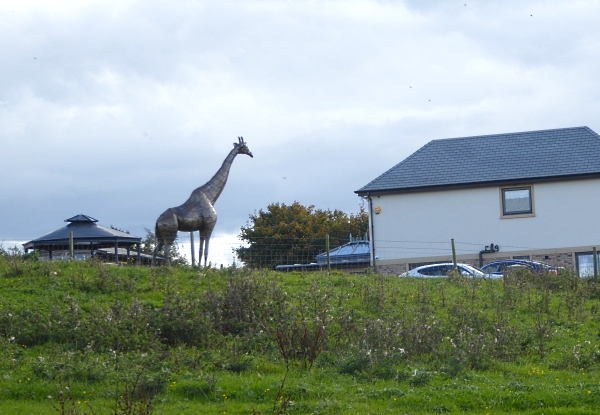 The house on Holly Lane near the reserve entrance has an enormous wooden sculpture of a giraffe in the garden! 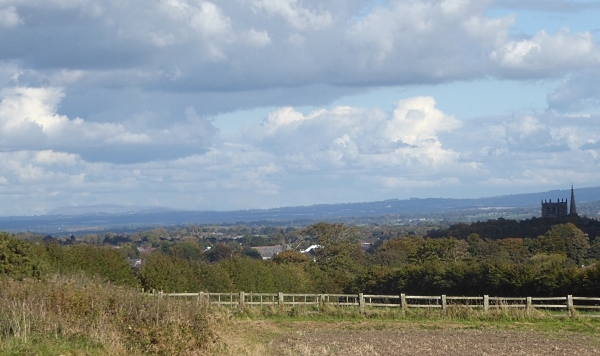 From the Communications Centre there is an extraordinary view over Ormskirk, which seems to be in a bowl. Way over to the left of its “tower-and-spire” church, and maybe 50 miles away north eastwards, is a big lump of high ground. Could it be Longridge Fell? Or perhaps even the Forest of Bowland? On the way back to the station we spotted a Snake-bark Maple tree in a garden in Long Lane. Once you get interested in them, they turn up everywhere! Going by the scarlet leaf-stalks and long strings of small seeds, I think it could be a Red Snake-bark Maple Acer capillipes. 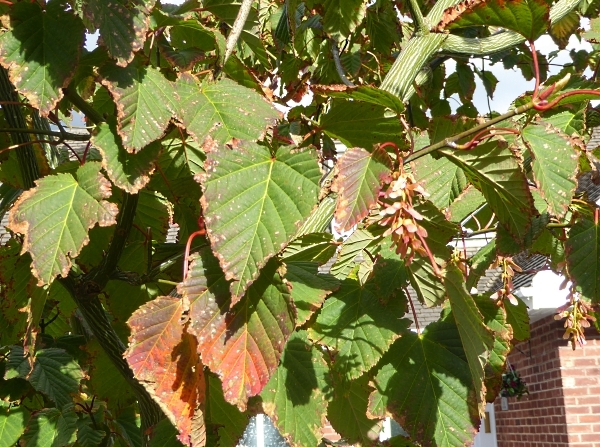 It’s said to be a favourite in small gardens for its very red autumn leaves. Nice bit of stripy bark showing in the top right of the picture, too. Public transport details: Ormskirk train from Central at 10.10, alighting Aughton Park at 10.37. Returned from Aughton Park at 2.53, arriving Central 3.20.